Good leaders often ask great questions. One of the first questions that MSA’s new Head of School, Mike Drude, asked when he arrived on campus was: why does the iconic bell tower have a bell that does not ring? This is a question that people at MSA hadn’t thought to ask for many years. MSA alumni who graduated in the 1950s were polled to see if the bell rang in their time on the Hill. Thus far, not a single alumnus can recall the bell ringing on the hour. “Other than someone manually ringing it to mark a special occasion--such as a sports victory or an historical event--I don’t think I ever heard it ring,” stated Bobby Shaw, class of '61. 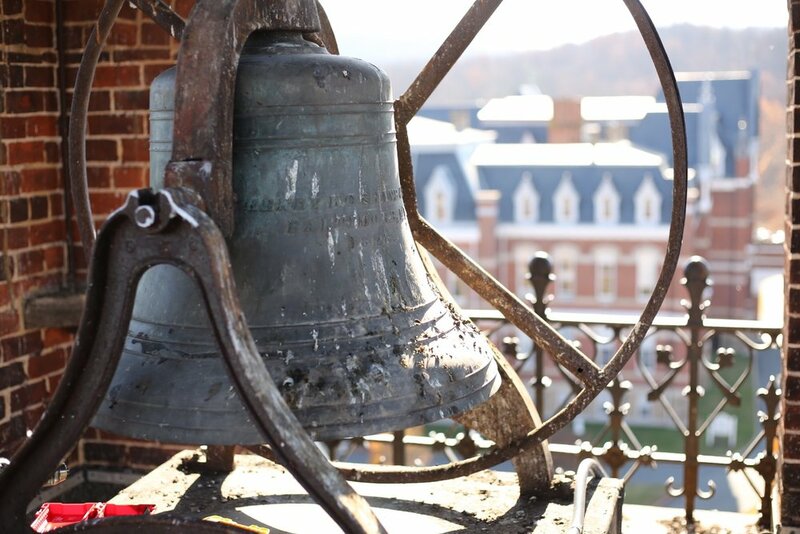 It is quite possible that the bell has been silently looking over the campus and the Blue Ridge Mountains for nearly a century. Caton Hall, which is home to the bell tower, was completed in 1883. It was the second major structure built on campus. Standing a few hundred yards north of Old Main, Caton Hall is one of the most visible and iconic structures in western Albemarle County. The bell tower can be seen from miles away on the surrounding country hillsides. In its early years, when MSA was a manual labor school, one can imagine students listening to the bell ring in the distance as they worked the fields in the upper and lower meadows. The bell would have signaled farmers to come in from their labor at meal times, the start of the academic day, the beginning of the school year, and the closing of the term. Long before pocket watches were common in rural areas, the bell would likely have kept time for residents in the western part of the county. While the history of when and why the bell stopped ringing remains unknown, the production of the bell itself is clear. The bell was produced by McShane Bell Foundry in Baltimore, Maryland in 1878. Still in business today, McShane Bell Foundry has been producing North America’s finest bells since 1856. Churches, colleges, and municipal buildings around the United States and Canada have McShane bells ringing in their towers. McShane has produced over 300,000 bells in its 162-year history. The forging of MSA’s bell would likely have been overseen by the company’s founder Henry McShane himself. Like all McShane bells, it is made from Ingot Copper and imported block tin. One person on campus who responded to Mr. Drude’s question this fall was Timothy Bradley, MSA’s technology coordinator. Mr. Bradley had been working on his own for many years to figure out a way to get the bell back in sync with the clock in the tower. “Old clocks have become a passion of mine over the years, and it has always been a dream to restore the mechanical system that syncs the bell ringing with the clock,” commented Mr. Bradley. In his research, Mr. Bradley learned that many of the custom-made mechanical pieces needed to make this happen had been lost over the years. “At some point, the mechanical system was disassembled, likely in an attempt to repair or refurbish. Unfortunately, the pieces and parts were misplaced or lost. As you can imagine, you can’t just go onto Amazon and order new parts for an antique system like this. To restore the original mechanical system would require re-fabrication of countless, one-of-a-kind small parts, and even then it would be difficult if not impossible to reconstruct. This clock and bell were masterfully built by an artisan with skills and expertise of a bygone era. It’s inspiring to see this level of craftsmanship and artistry--it is near perfection in a mechanical system.” With this on his mind, Mr. Bradley looked for alternative methods to revive the bell. He found The Verdin Group, a company that specializes in electronic systems to ring bells just like MSA’s. After many hours of phone conversations and photographs sent, Verdin Group devised a plan with Mr. Bradley for the installation of a ringer that is controlled by a digital system. Before this installation could take place, the bell tower had to have an entirely new electric system installed. This was done in-house by Mr. Shanon Norris, one of MSA’s operations crew members. “Being able to do this important facet of the project in-house saved the school significant money, which was used for the new system,” commented Mr. Bradley. Funding for the entire project was provided by MSA’s Alumni Association. 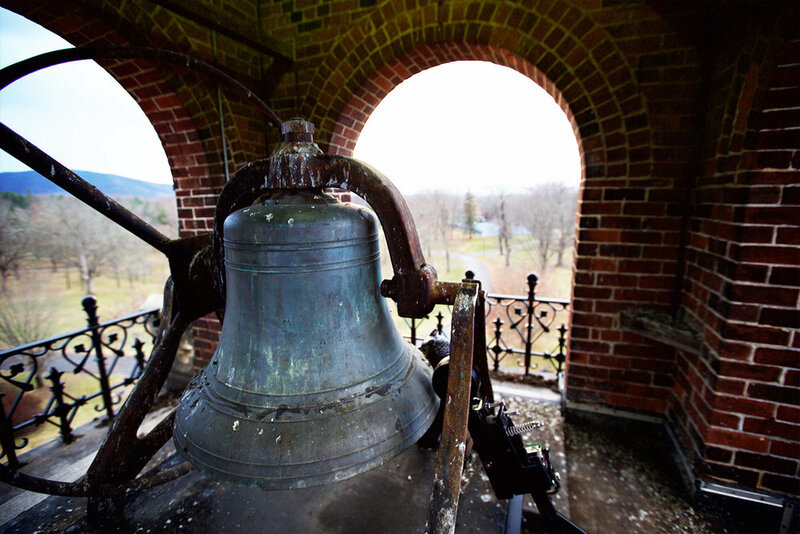 The restoration of the bell is both a tribute to MSA’s past and a celebration of MSA’s future. Regardless of when one graduated from this remarkable school, everyone can appreciate the importance and significance of the bell tower. Hearing the bell ring pulls the MSA family together as a community. 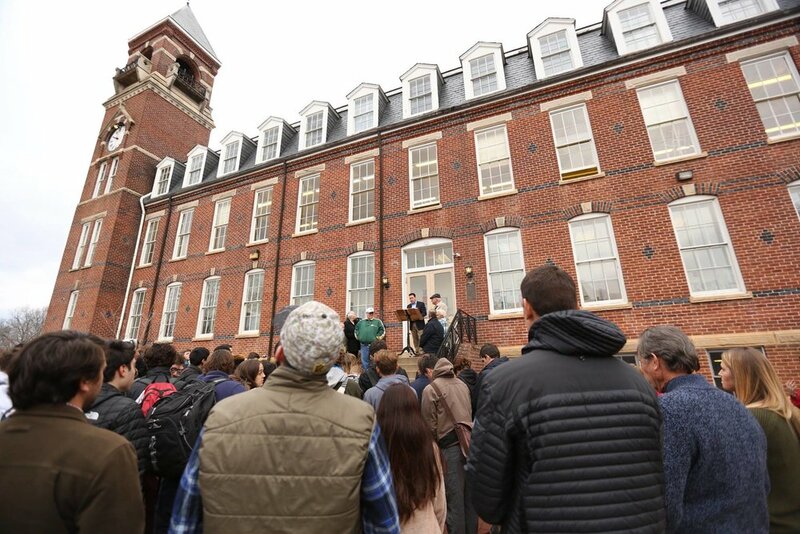 On December 12 at 10:00 AM, students, faculty, staff, and alumni gathered below the iconic tower to celebrate the restoration of the bell. As the MSA community listened as the clock struck ten, thoughts of both the school’s remarkable history as well as its bright future resounded through the countryside. With the beautiful sound of the bell ringing again on the Hill, Mr. Drude had his question answered.